If Woman's Place Is in the Home, Where's Home for These Wives? When networks or newspapers hire foreign correspondents, they don't officially recognize the correspondents' personal problems in the form of wives and children. However, "it would be a hard-hearted editor indeed," says Wells Church, editor-in-chief of CBS News, "who would completely ignore the special problems created by a correspondent's family." The women who marry foreign correspondents, says Church, fully recognize the fact that they are wedding men whose assignments may, and do, carry them all over the world. In fact, many CBS correspondents met their spouses abroad while on news assignment. Winston Burdett, for instance, found his wife Georgina while on his news beat in Italy. He's CBS correspondent in Rome. Richard C. Hottelet, CBS correspondent in Berlin, married an Englishwoman named Anne. Larry LeSueur, now United Nations correspondent for CBS, also found his better half, Priscilla Bruce, in England. Howard K. Smith, now chief of CBS' European staff and stationed in London, wed a Dane, Benedicte. 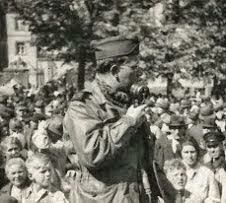 David Schoenbrun, CBS correspondent in Paris, married an American, Dorothy, but he met and courted her in Paris. While correspondents' wives realize they have married global traveling men, they see no reason why they can't travel too. "This is a problem that hardly touched us during World War II," Church says. "Most of our men—Hottelet, Smith, LeSueur, Schoenbrun, Bill Downs and Charles Collingwood—were single men, hell-for-leather characters without home base ties. "After the shooting was over, naturally, being normal men, they wanted to settle down with wife and family. Now that the world is in crisis again, we are calling on our crackerjack correspondents of the last war to go traveling, again, and find most of them with wife and child, eager to travel but also eager to keep family together." When Hottelet replaced Downs in Berlin early this year, he took his wife and two children with him. Church, unofficially, of course, worries about them in the event of an East-West situation. Helen Costello, wife of Bill Costello, CBS correspondent who has gone westward to Tokyo and Korea, wants very much to follow her husband there. "After all," she tells Church, "I was with Bill in Tokyo before. Why can't I go now?" Bill Downs was on the verge of buying a house when the Korean episode exploded, and off he went to Korea. Roz Downs is currently visiting his family, acquainting her son, Bill III, with Bill's father, a railroad engineer in Kansas. But she has already notified Editor-in-Chief Church that she and her son want to join Bill in the Far East. This desire to keep together, despite divisive assignments, had Charles Collingwood, CBS Washington correspondent, and his lovely wife, Louise Allbritton, commuting regularly from New York to Washington to California, where each of them had radio, television, or movie assignments. Being together seems to be the thing. "I don't know what to do about placating wives who want to join their husbands in far-off and dangerous places," says Church. "It's another matter if wives are with their husbands when war breaks out." Church continues, "Janet, wife of Ed Murrow, went through the Britain blitz with her husband, and was active in the 'Bundles for Britain' campaign. I hope I won't be hearing from Janet about joining Ed, who has already left for the Orient. Sometimes I think what we need is a vice president in charge of war correspondents' wives."